Don't Bug Us: 4th Grade Has Been Reading! 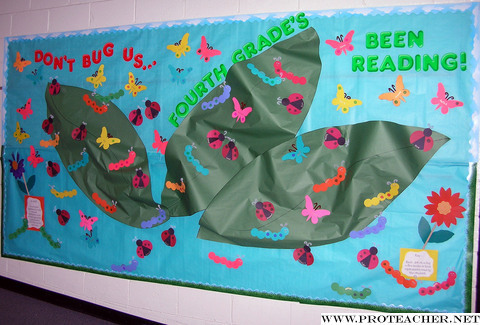 This bulletin board is set up to show the number of books that the children have read during the year. Each child has a bug with their name on it placed on the board. The students are able to place a dot on their ladybug, caterpillar, or ladybug for each set of 5 books read. The insects are made out of cardstock and pipe cleaners and we use a bingo marker to place the dots onto the bugs.